Git is a good thing and offers many new options – but in fact the entrence is very hard and even if you follow the guide on GitHub it’s not that easy. Especially the Tooling isn’t well known territory for Windows / .NET developer. The GitHub guys, among others Phil Haack, recognized the problem and the first impression looks good. 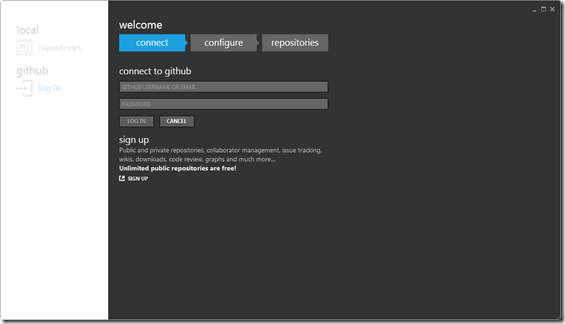 On the one hand it’s the bridge to the GitHub.com side – you can see your repositories and replicate them if you like. On the other hand PoSh-Git is going to be installed directly. Anyway it’s a good support for the entrance into Git. You can download them here and it should be able to update automatically. 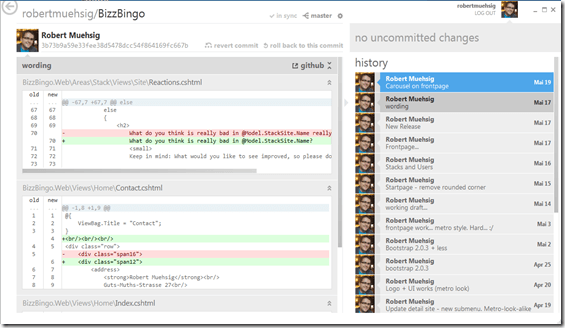 A pretty “Metro”-look-a-like-App welcomes us and asks for the Credentials to GitHub. 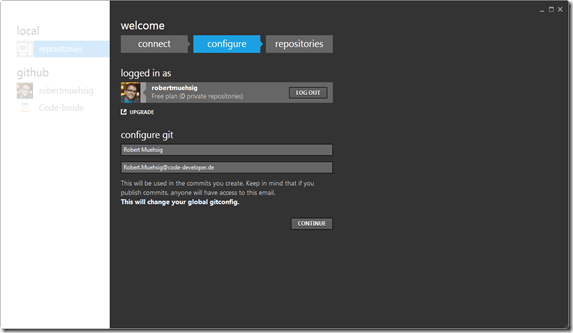 After the Login the basic settings for Git are going to be set (gitconfig). Unfortunately I skipped the 3. Step accidently because of this all I had was my Repositories which lay on GitHub.com. 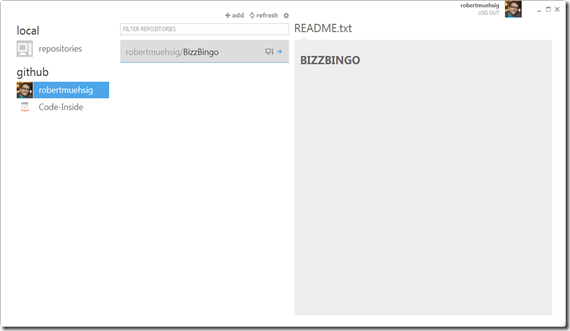 With Drag-n-Drop it’s possible to get local Repositories into the application and you are able to take a look on the whole history and the state. It’s also very comfortable to use Git from the prompt. 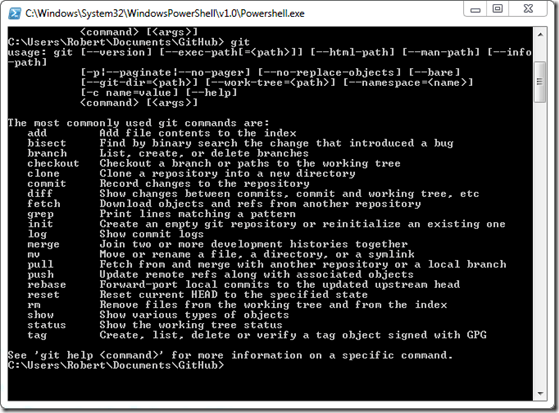 Usually you need to fight with msysGit and the Bash but GitHub for Windows installs Posh-Git for the Powershell automatically. But you can choose for yourself which Shell you are prefers in the end. 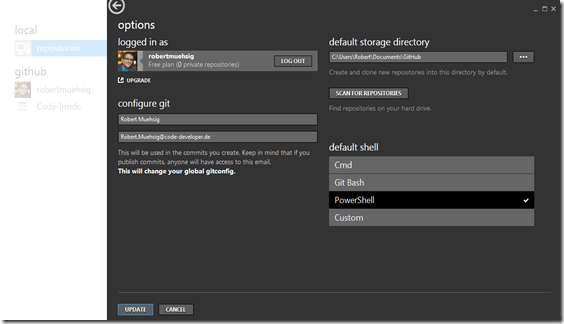 GitHub for Windows isn’t a complete GUI for all orders from Git and do not enter Visual-Studio or anything. 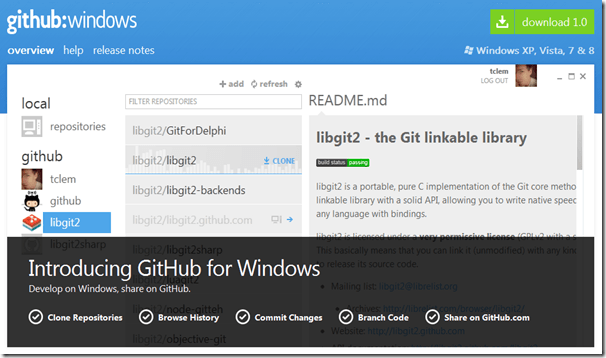 If you have GitHub Repositories and work with Windows: Install. How (and if) it works with Git Hostern (Codeplex for example) I can’t tell but the UI with the Metro-look is very comfortable. What’s your opinion about GitHub and Git? What’s good at GitHub? What’s bad? You are welcome to tell me on KnowYourStack (of course the project is hosted at GitHub).